Diamond and Rib is a somewhat odd name for this pattern. The Rib part of the name is obvious, Diamond refers to the smooth, sort of diamond shaped areas separating the ovals of fine ribs. These ovals were, before the vases were swung, circles of fine ribs. In some examples the ovals are so elongated that the pattern is difficult to identify. 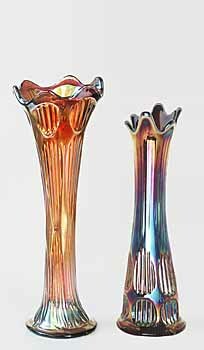 Diamond and Rib vases can be found in two sizes, standard and funeral. There are actually three different molds for the standard size, with base diameters ranging from 3 to 3 1/2 inches. Two of the molds have three rings of ribbed ovals; one has four rings. Heights for all standard size Diamond and Ribs range from about 6 to about 13 inches. The funeral has a base diameter of 5 1/4 inches and a height range of 17 to more than 21 inches. At left in the left photo is a typical Diamond and Rib vase in marigold. Next to it is an oddly shaped example in purple that sold for $950 in 2000. 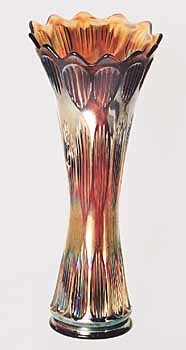 Diamond and Rib vases have been reproduced. There are a couple of spittoon shaped whimsies.